What Trump's Threat To End A U.S.-Russia Nuclear Arms Treaty Means For Putin The 1987 Intermediate-Range Nuclear Forces Treaty marked the end of the Cold War. The Kremlin may want to leave the agreement, too. President Ronald Reagan (right) and Soviet leader Mikhail Gorbachev exchange pens during the Intermediate Range Nuclear Forces Treaty signing ceremony in the White House on Dec. 8, 1987. Gorbachev's translator Pavel Palazhchenko stands in the middle. U.S. National Security Adviser John Bolton arrived in Moscow this weekend to a murmur of dampened outrage over President Trump's announcement to leave the 1987 arms control treaty that marked the end of the Cold War. 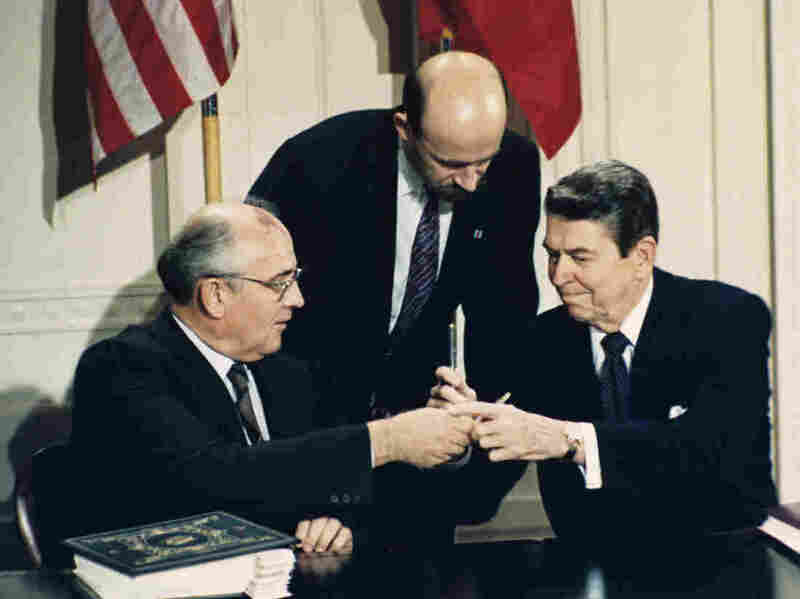 Mikhail Gorbachev, the former Soviet leader who signed the Intermediate-Range Nuclear Forces Treaty with then-President Ronald Reagan, called the decision a "mistake" that didn't originate from a great mind. While some Russian lawmakers grumbled about "continuing blackmail" and "a blow to strategic stability," top officials held their fire before they had a chance to talk with Bolton. Foreign Minister Sergei Lavrov quipped that it isn't productive to divine coffee grounds as to the Trump administration's plans. And President Vladimir Putin's spokesman, Dmitry Peskov, told reporters that the U.S. hadn't undertaken any formal steps yet to exit the INF Treaty. For the Kremlin, a U.S. withdrawal would feed into the narrative that the United States is an unreliable partner that acts unilaterally with little regard for other countries' interests. There is a widespread feeling in Russia that after the Cold War, Washington didn't do enough to create a new, inclusive security agreement together with Moscow. In 2002, George W. Bush's administration left the Anti-Ballistic Missile Treaty, freeing up the U.S. to develop a missile defense shield, despite Russian objections. The demise of the INF Treaty could now put the future of the New START — an arms control agreement negotiated by the Obama administration — into question. Some observers in Moscow say Trump's threat to leave the INF Treaty may be an opening gambit for an administration that often puts everything on the line before entering negotiations. "If there's good will on both sides, including ours, then probably the treaty can be saved," Ruslan Pukhov, the head of the Moscow-based Center for Analysis of Strategies and Technologies, said on state television. The world has changed a lot in the three decades since the treaty's signing, so it certainly needs amendments, Pukhov said. One example is the appearance of armed drones in the U.S. arsenal, which Moscow considers a violation of the INF Treaty. "Tomahawks with nuclear warheads could be loaded up at anti-missile sites in Romania and Poland as soon as U.S. leaves INF Treaty," tweeted Igor Korotchenko, editor of the Russian magazine National Defense. Korotchenko said the risk of a repeat of the 1962 Cuban Missile Crisis — when the U.S. and the Soviet Union were on the brink of nuclear war — will increase in Europe, since the reaction time for Russian decision-makers shortens the closer missiles are deployed to Russia's borders. But words of regret about the INF Treaty's demise may include a fair amount of hyperbole. "This is one of Vladimir Putin's big diplomatic achievements, which he was striving toward for almost all his years as the country's leader," Frolov wrote on the Russian news site Republic. "For Russia's military-industrial complex and security services, the INF Treaty was always like a bullfighter's red cape; it symbolized the country's defeat in the Cold War."